We picked Disney's Polynesian for this trip because it was on the monorail and thus would be easy to get over to the Contemporary for the Destination D event. In the end, it really wasn't all that convenient for that as we really aren't fans of the ramps up to the monorail at the Transportation & Ticket Center and Magic Kingdom in the first place and then found we really hate the setup for the station at the Contemporary and to some extent also the Polynesian (not enough elevators for the traffic in the Great Ceremonial House at peak times). For the most part, we just used the ferry boat from the Ticket & Transportation Center to get to the Magic Kingdom and then walked to the Contemporary, but we found the Resort Monorail was the only option to get to the morning sessions. Despite not being a fan of the monorail, the Polynesian is now our favorite DVC resort (at least when it's just us and we can do a studio). If we do Destination D again, we probably would stay somewhere else and do the bus to the Magic Kingdom and then walk to Contemporary, but for regular Walt Disney World trips the Polynesian works because as long as we weren't going to the Magic Kingdom before park opening we found the ferry to be an option, especially since we were in Pago Pago, which is the closest building to the Ticket & Transportation Center. While Epcot is still only accessible by Monorail from the Polynesian, we avoid having to go up the ramp at the Transportation & Ticket Center by usually starting our day with Toy Story Mania at Hollywood Studios and then taking the boat to Epcot and at Epcot the Monorail station has an elevator along with much lower grade ramps, so we only have to deal with the steep ramp going down once. The main reason we are a huge fan of the Polynesian is that the doors are set almost like the ones that we love on the Disney Cruise ships. 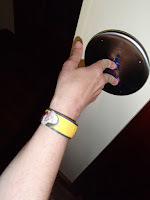 The door doesn't automatically open when you unlock it with your Magicband, but it does once you push it slightly and when you pull it slightly to leave. There is also a button inside, which I assume is supposed to activate it open to leave, but Mik was quickly disappointed that it did absolutely nothing when he pushed it. We didn't get around to asking about it, but it was either broken or it could be something that you have to ask to be activated for your stay. We also mostly really liked the layout of the studio. 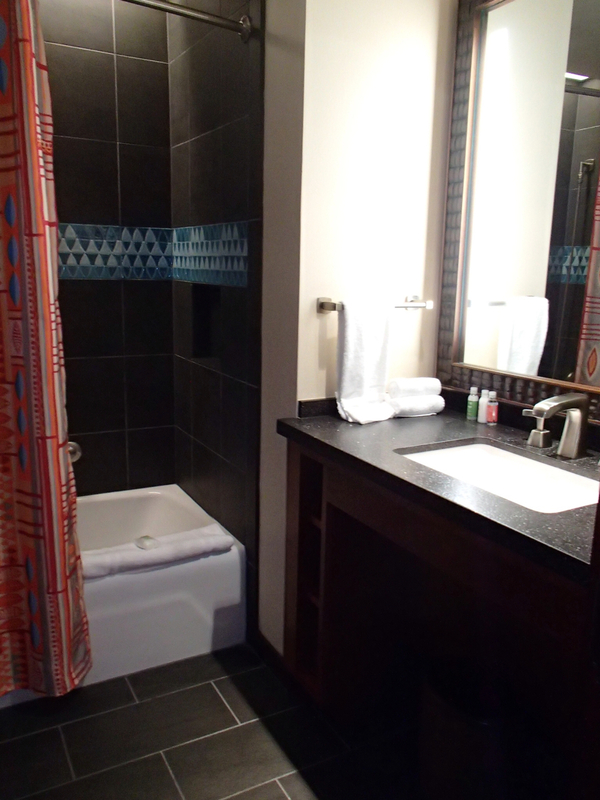 It is nice how the studios here have a bathroom as well as another room with a second sink and shower. As just two people, we don't need that extra area to get ready, but it was nice to have roll-in shower in the main bathroom and still also have a regular shower for me to use instead of having to use the roll-in shower, which is often not that great of an experience. 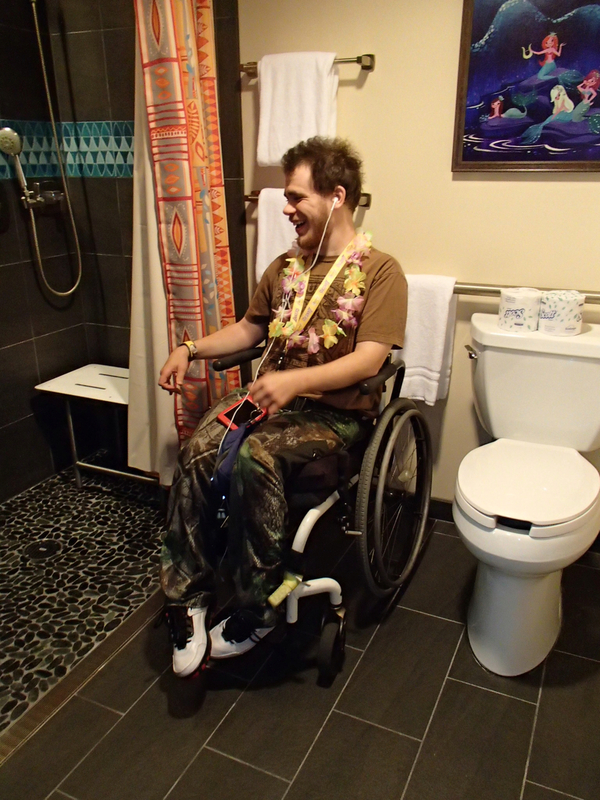 Mik particularly liked the bathroom layout as he quickly discovered he could easily roll up next to the toilet to park his chair. 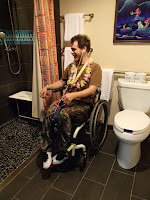 He also found the space easy for going to the bathroom on his own, which isn't always the case for him in "accessible" hotel bathrooms. We also liked the bed that folds down from below the TV as I used that and Mik used the queen bed, so we didn't have to deal with the fold out couch and always had plenty of floor space to maneuver around. 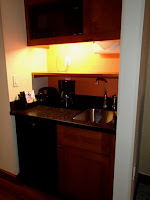 The only problem we had with the room was the kitchen area. It was not at all designed to be accessible. For the most that didn't matter to us, but the microwave is even higher than a regular home kitchen that has one mounted above a stove that even I almost couldn't use it at all. 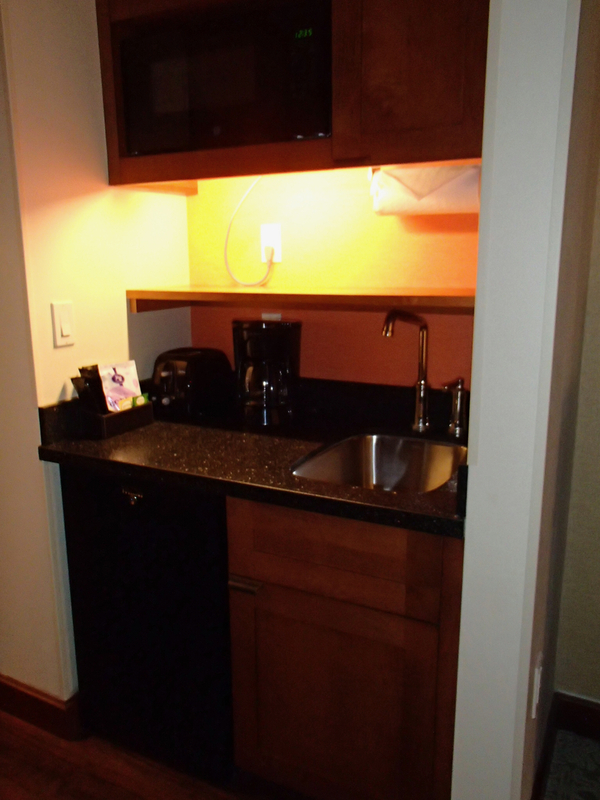 This was extremely disappointing to us in that the first time (and possibly only other time) we've done a DVC studio was the only time Mik has ever been able to use a hotel microwave because it was below the counter. 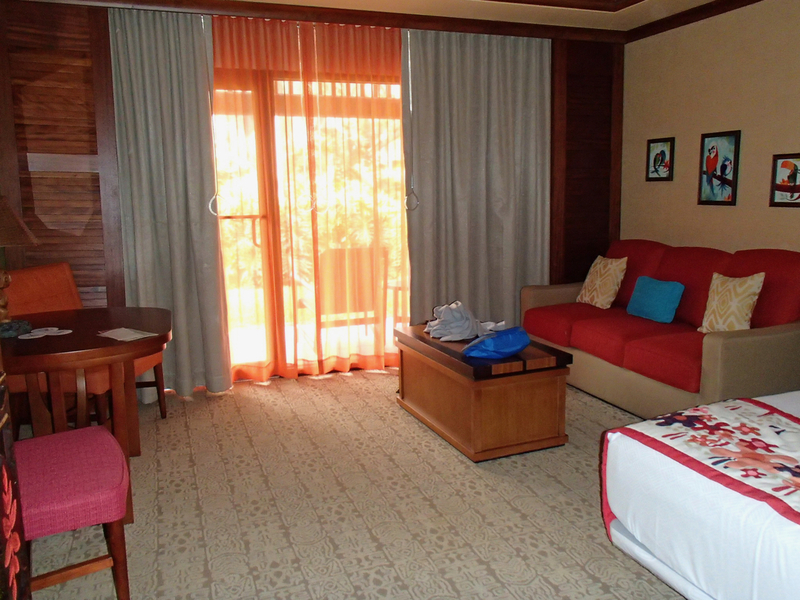 Overall, though, we really enjoy the room and the resort location. The only other thing that we didn't like was that the beverage and food options for grab and go are extremely limited, especially compared to what we got used to from the cafeteria option on our last trip when we paid to stay at a value resort, but it was also more limited than we have found at the other DVC resorts shops in terms of beverages and grocery type items. 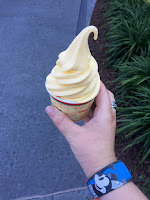 However, you can't beat that the Polynesian Resort has Dole Whips, so it's sort of a wash.